Found throughout many of the major river systems of northern South America. It’s been recorded from Ecuador, Colombia, Venezuela, Guyana, Peru, Bolivia and Brazil in the Rio SÃ£o Francisco and Rio Essequibo basins, amongst others. A population is also thought to exist in the Rio Orinoco. 36″ (90cm) – unlikely to attain this size in captivity. 8′ x 2′ x 4′ (240cm x 60cm x 120cm) – 1700 litres as a minmum for a single adult fish. Bear in miond this species does better as part of a group. Consideration should be given to a tropical pond. 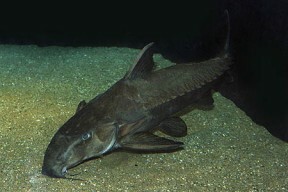 Temperature: 70 – 77°F (21 – 25°C) – although can be found in warmer waters in the wild. 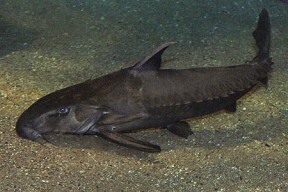 An omnivorous detrivore. Wild fish consume anything edible they find as they sift through the substrate, although a large proportion of the diet is composed of benthic crustaceans and the larval forms of various insects. Will accept most aquarium foods. Ensure vegetable matter and live or frozen foods form a regular part of the diet. Gentle giant. Keep with other large peaceful species such as other large cats, arowana and large characins such as pacu and silver dollars. May eat fish small enough to fit in its mouth. 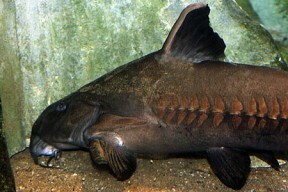 Previously referred to a Pseudodoras niger, the Ripsaw Cat is a fish only for the experienced fishkeeper due to its large adult size. 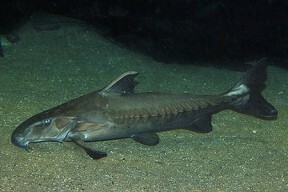 Although a visually stunning fish, realistically, it is best suited to public aquaria. Much more peaceful than its common name suggests, which it gets from the spines that run down the lateral line of the fish. This fish is becoming more readily available to the hobby and prices are also falling, meaning that many fishkeepers are being tempted into buying a fish that they will be unable to care for on a permanent basis. It can also be very difficult to move large fish on when they have outgrown your tank, as not many people want (or can keep) fish of this size and there is no guarantee that your local aquatic outlet or aquarium will be able to take it.